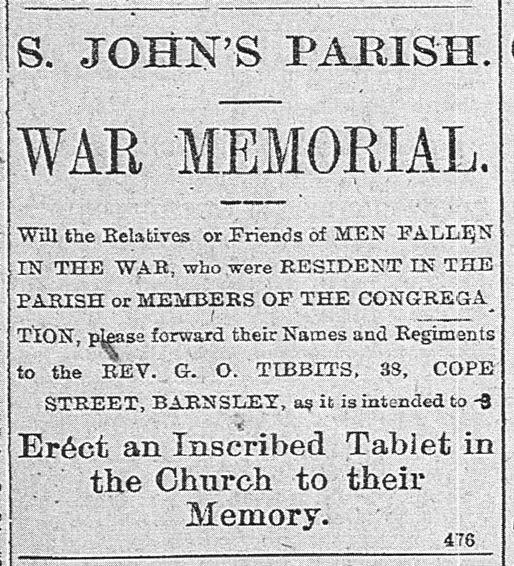 A Barnsley Historian's View: Where oh Where did the War Memorials Go - from St George's and St John's churches, Barnsley? Where oh Where did the War Memorials Go - from St George's and St John's churches, Barnsley? Yesterday was my usual weekly visit to Barnsley Archives with my friend GB. I have been going twice a week, but things caught up with me on Tuesday and I had to spend the day in bed after a busy weekend, so no pub inventories this week. I'm still a bit groggy and didn't wake up until 11am today (the cat went out at 7am) but overall I feel "not too bad", so that's better than unconscious! 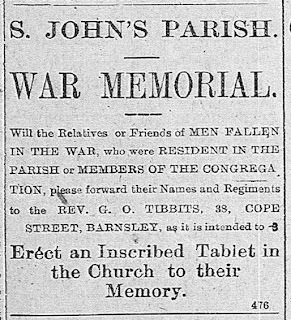 I've been looking into the process of setting up memorials to the First World War in Barnsley and District. I had previously searched through the first six months of 1920 but I had realised as I read the Chronicle that discussions about memorials had started much earlier so this week I jumped back to the beginning of 1919. Erect an Inscribed Tablet in the Church to their Memory." St John's Church was in the centre of the Bare Bones or Wilson's Piece area of Barnsley, on the southern edge of the town centre and where some of the housing dated back to the end of the 18th century. In the early 20th century the area was densely packed and overcrowded. 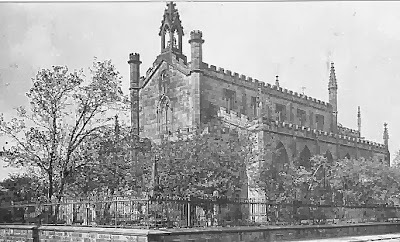 St John's records in Barnsley Archives go back to 1845 for baptisms and to 1858 for marriages. Prior to that the Church of England residents would have gone to St George's, which opened a little earlier or St Mary's in the town centre. There were no burials from the church, probably due to the proximity of Barnsley Cemetery. The building work in front of the church is one of the small blocks of flats on Union Street/Duke Crescent. 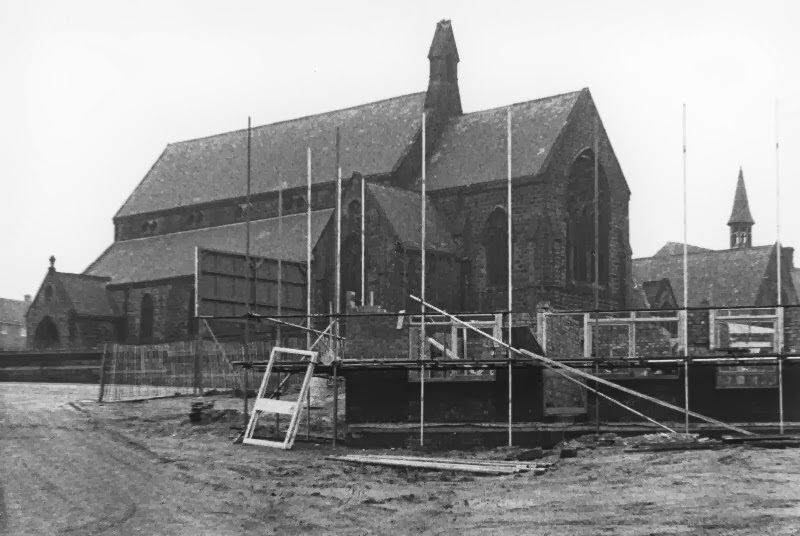 The church was closed in 1968 and demolished soon afterwards. An old peoples home stands on the site now. So where did the "Inscribed Tablet" go? To which local church did the congregation move? 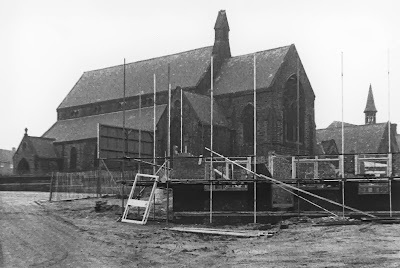 Maybe St Peter's on Doncaster Road? Have they got the tablet? The article states that "chapel of oak panelling and the stained glass windows are distinct ornaments to the sacred edifice and will prove lasting memorials of those in whose honour they have been placed". 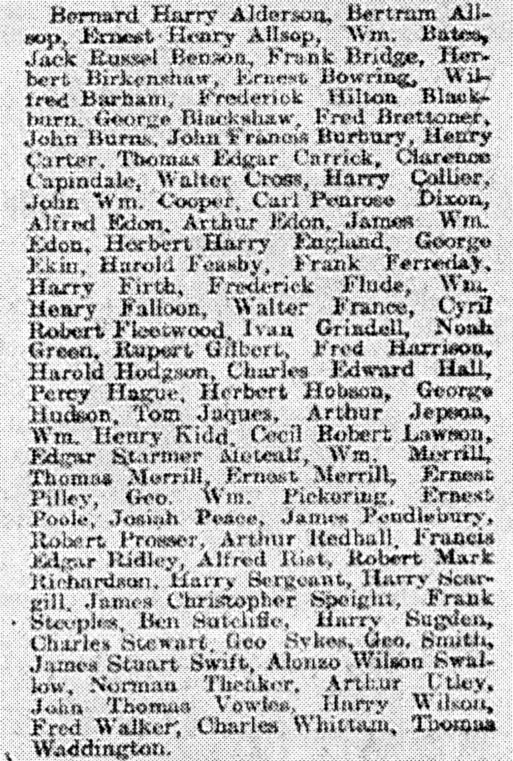 I find it particularly moving that several of the surnames crop up more than once; there are two Allsops, three Edons, and three Merrills in the list. Also some names familiar to me appear - Tom Jaques, Fred Brettoner and Alonzo Wilson Swallow - all three men connected to the OH's family tree. I have written Alonzo's story in a previous blog post. St George's church was older than St John's, but not by much. The first records in Barnsley Archives are baptisms in 1832 and marriages in 1837. It was demolished in 1993 after being closed for some years. I understand that the building was unsafe. The congregation moved to a modern building not far away and the churchyard is still there surrounded by the railings you can see in the picture above (from the Yococo website again) with a surprisingly small empty space in the middle where the church once stood. 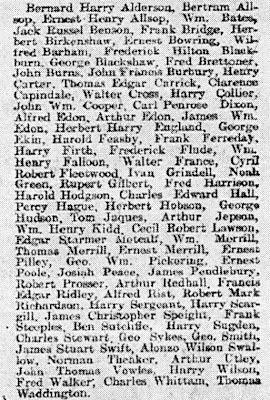 Are there any records in the new St George's about the men who whose names were read out in 1919? Was a plaque erected in the church with their names and did it get moved to the new church? I will continue my search in future weeks and in the meantime if anyone knows the whereabouts of the memorials from these two churches could you please get in touch? Dear Barnsley Historian. I'm doing some research on My Great Grandma and Granddad. SHe was Mary Ellen Hassall, born c 1888. She married Richard Lovatt (In the war as Joseph Lovatt) at barnsley registry office on 1st December 1909. My mum says she was in service to a minister. Her address on the marriage certificate is 3 court 3 copper street, barnsley. which was tenanted by a char woman in 1911 census. Could you shed any light on which minister she might have been in service with. - She wasn't working when she got married, due to being 8 months pregnant. Also, do you know what a Baylie stoker trier did at Beevor Bleach works? As your great grandparents married in the Register Office that might suggest she was a Non-Conformist, a Methodist or Baptist of some kind. I would imagine that if she had worked for a C of E minister he would have wanted her to marry in his church, even at her advanced state of pregnancy. There were a number of non-conformist churches in the Copper Street, Sheffield Road area, so I couldn't hazard a guess any further. As for the occupation you best bet is to Google the term or to call into your local Archives (do you live in Barnsley?) and enquire. They may have records and books to help you find out what your ancestor did for a living.